The Phoenix Mayor's Commission on Disability Issues held their 2017 Disability Awards and Recognition Event on October 24th, at the Pueblo Grande Museum in Downtown Phoenix. 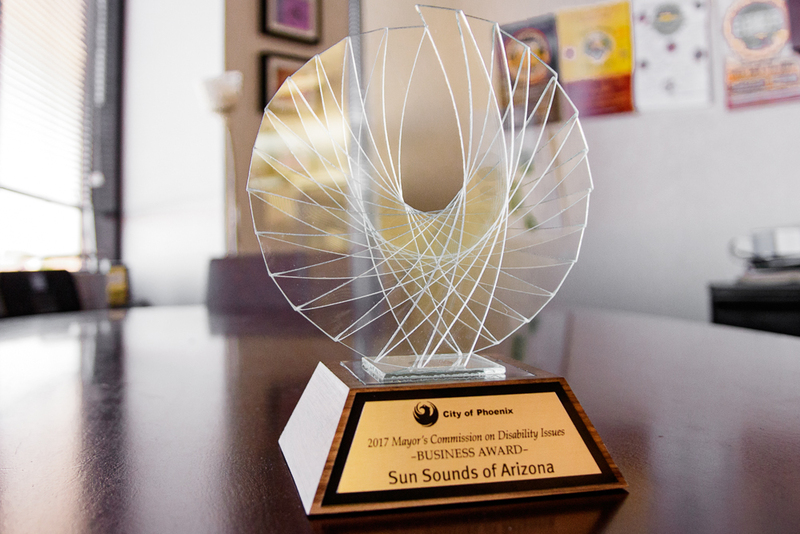 Sun Sounds of Arizona was awarded with the Business Excellence Award for Non-Profits. The Business Excellence Award honors organizations that have improved access for disabled customers or employees and has created increased employment opportunities for individuals with a disability; both of which Sun Sounds accomplishes. Sun Sounds of Arizona provides audio access information to people who cannot read print because of a restricting disability. Sun Sounds of Arizona makes creative use of technology and talent to ensure that every disabled person has the opportunity to access the current and local information necessary to a self-directed, productive life. Effectively this will help establish that the inability to read print will no longer be a disabling condition. Sun Sounds of Arizona will continue to be a leader in the field of information access services and a willing partner to organizations with like goals. Sun Sounds of Arizona is innovative, committed to quality and to customer satisfaction.